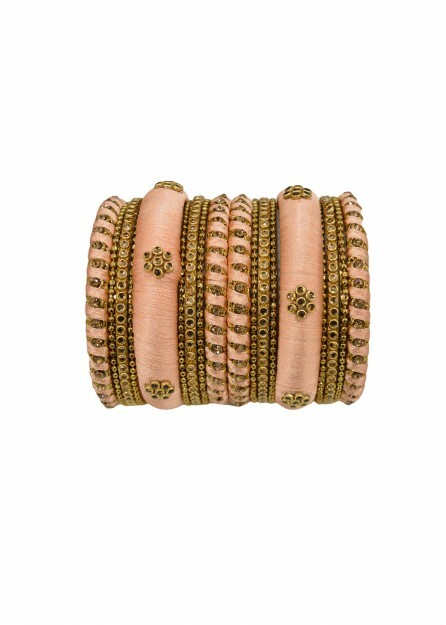 Antic Gold Lct Stone with Peach Thread Bangles. Silk thread bangles also include bead work to make the sets more unique. The bangles are wrapped in silk thread. Bangles metal is antic golden finish and high quality lct stones and peach thread used. Silk thread bangles also include bead work to make the sets more unique. The bangles are wrapped in silk thread. This complete look provides not only colour from the threads but also richness from the lct stones. Available in a range of sizes.